don't get caught: Tell It Better: Should you or your speechwriter get the story for your speech? Tell It Better: Should you or your speechwriter get the story for your speech? 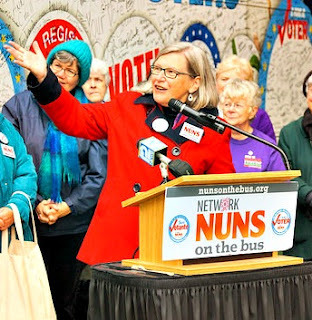 Sister Simone Campbell is no stranger to my blogs, as we include her "Nuns on the Bus" tour in The Eloquent Woman Index of Famous Speeches by Women. An attorney, nun, and lobbyist for social change, Campbell is a frequent speaker who, in a recent interview with On Being, shared advice about how you should be collecting stories for your speeches. Her view: The source will determine your authenticity as a speaker. SR. SIMONE: Well, if we're open-handed, then I know a few things. One is no guarantees. All is fragile. It's all gift. And it also needs to be shared. And being willing to share what I have or what I have been given then becomes the way that we can really engage each other. And one of the pieces that gets lost is it's as much monetary as it is our stories. And that creates the bond of community where then the economy is better because we build each other up. How could I leave you out if I've heard your story? I can't. So I have to make sure you're OK. Check in every now and then. SR. SIMONE: Well you know one of the problems with most of the stories in the political speeches is somebody else went out and found the story. And then it gets slipped into a politician's talk. I mean, the president does it in the State of the Union. I've been asked for stories. SR. SIMONE: But the problem is, is the real power of story is to let my heart be broken by the story, to hear it from you directly or to hear it from whoever directly. Then I'm never the same. And — as opposed to using it as a good shtick. I've worked for decades with speakers, including politicians, who've had heart-warming stories written into their speeches by others. I've written some of them myself. For many speakers, putting across these stories with authenticity, heart, and passion is nearly impossible, and it's not just because they have to read the unknown-to-them story. The best stories to tell are the ones you know well, and without a script. Even a speechwriting pro will write TELL VACUUM CLEANER STORY in a script rather than write it out. If you think of public speaking as a type of testimony, a chance to share the experiences you have witnessed directly, this approach to storytelling makes eminent sense. That's difficult, but not impossible, to do, even if you're, say, the President of the United States. We talk a lot about how authenticity is prized in speakers today, and that starts with your stories. They shouldn't come off the shelf. Writer Cheryl Strayed reminds why it's so important that "the" story be "your" story: "When you’re speaking in the truest, most intimate voice about your life, you are speaking with the universal voice," she says. It's almost ironic. If you want the truly universal story, dig into your own experience. She was speaking of memoir, but then, what is a story in a speech but a little memoir? If you're lucky enough to work with a professional speechwriter, spend enough time with her to share your firsthand stories and experiences. 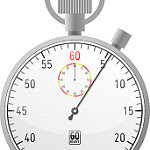 (Any speechwriter will tell you that lack of time and details from their principal is among the biggest barriers to giving you a great speech.) If you are writing your own speeches, start a collection of your firsthand stories and experiences, and prefer them over anecdotes from others. Not giving a speech? This approach works in presentations and in social media as well. You'll get more immediacy, authenticity, and electricity if you can retell a story that has, in Sister Simone's words, let your heart be broken. No amount of adjectives and adverbs can make up for your authentic experience.